It only seems like yesterday that Paul Morrell and Francis Maude signed the industry up to the 2011 Construction Strategy; we had just welcomed a new kind of Government and they were talking about a new approach. Chair of the government’s BIM Task Force Mark Bew reviews the last four years. The scene was set; Liam Byrne the outgoing Chief Secretary to the Treasury’s note told us what we already knew, “I’m afraid to tell you there’s no money left”. The country needed a new plan and so did construction. But how was the digital Building Information Modelling (BIM) revolution in construction and five years of austerity going work together? Would the downturn completely obliterate the industry? Would we be able to get traction to survive, change and face a new future? Well, four years later as the news of the Conservatives having managed to gain a majority sinks in, construction is fully in both domestic and international recovery. But how is the sector shaping up with its digital switch over in the run up to the 2016 BIM procurement mandate? 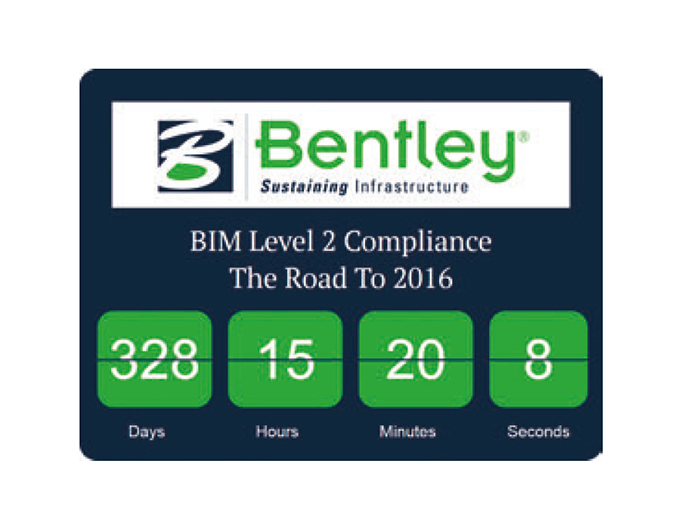 Is the infrastructure sector ready to meet the Government’s 2016 mandate to use BIM level 2? We have all come a long way. A combined Industry-Government BIM Task Group has been deployed and the team engaged in three key tasks. 2. Set up a public sector client engagement group. Terry Stocks chairs this Stewardship Group, under the governance of the Government Construction Board. The Group ensures delivery of individual department plans to achieve both the 2016 targets. 3. Engagement of the supply chain. There isn’t a working day that someone from the Task Group isn’t participating – digitally or physically - at an event somewhere, with locations as diverse as Sydney to Sydenham. So the scene is set well from the Government side, but the industry response has been the really impressive statistic. The entire sector had been desperate to find a new way and BIM seems to have been the rather awkward hook on which we have all hung our hats. There were always going to be challenges. But now as the date comes closer we see more and more projects declaring the BIM credentials. We may not have every job using Level 2 on 6 April 2016, but very many will be. What are still the biggest challenges for the industry supply chain? The management of change in any business is a challenge and the last four years have presented plenty of change. As we reach our 2016 target we see plenty of projects using BIM and delivering improved performance. We see a few that maybe haven’t. But why? We have proved beyond doubt that by implementing BIM, Soft Landings, Project Bank Accounts and Procurement change we can drive up to 20% savings. The 2013/14 numbers on the Cabinet Office website show that this equates to £1.2bn, a prize well worth repeating. We need urgently to find much better methods of growing capacity to deliver and providing good leadership but this isn’t exclusive to BIM. BIM is not a silver bullet to save poor businesses from failure, but it is a fantastic opportunity to work out what it needs to face a different future. What are the greatest challenges for public sector clients? Delivering good value for tax payer’s money with the challenges of infinite demand, diverse public perception and political expediency has been the challenge for generations. It is increasingly clear that more of the old medicine isn’t the solution to these complex challenges. The use of data both BIM derived and other data used carefully is showing how in time we will develop better methods of providing transparency of future workload, decisions and reward. The use of BIM data provided by the supply chain is a keystone of the BIM Level 2 processes. But we need the best quality clients possible to apply these technologies to the challenges of future demand. Do you think the industry now sees BIM as a business advantage? The best thing about an open market economy is that nobody does anything that isn’t exactly what is required in the contract. The amount of projects we see in the private sector and around the world where there is no mandate is good evidence that the market has identified significant value. We should be rightly proud that the rest of the world is once again looking to the UK for leadership and direction. We need to start to look at digital and BIM as “proper” engineering. We have a real edge, but it won’t last forever, I suggest we make the most of it while we can. Where are the greatest successes for you? There are a couple of big things which when I look back I really consider as important. The first is the realisation that the UK made the right move in 2011. We haven’t any better capabilities or technology than anyone else in the world, but the simple fact we have a plan is what has set us apart, along with the commitment to see it through. This is one of the reasons Government has committed to Level 3 and Digital Built Britain. The second is the way BIM has worked as a “Trojan Horse” to allow us to focus us on how far we have drifted away from the basics of design and construction. Some of the old disciplines were in place for very good reasons but the transparency of good clean valid data that BIM provides quickly shows up poor performance. We must re-double our efforts to build on the basics so these new digital skills have context and value. In hindsight was level 2 BIM too big a stretch for much of the supply chain? When we launched in 2011 everyone said “is that it, only a spreadsheet?” Then people tried and discovered that being good at managing data is actually a tough job, one that perhaps some of us should have been better at before. So from what I am seeing we got it just about right…”a significant stretch, but not a stretch too far”. People can’t expect to deliver poor performance and not suffer the consequences, they shouldn’t expect to not develop their staff, products and businesses to deliver value to the client and remain competitive. Surely these are the critical measures of value? How is industry leveraging the successes of BIM to date? The market has already identified areas of competitive advantage. The use of models for tender pricing has already been a game changer in a number of sectors including power. However the real benefits are coming from using the project data to provide new insights into soft landings, user driven design development, health and safety and machine tool integration. Does a booming market make embracing BIM easier or harder? There’s never a good or bad time to intervene in a market, you just need to make sure you have aligned your goals. The downturn provided opportunities including access to resources and capabilities that would have normally been deployed on site. However the boom has the opposite effect, but it does encourage people to invest and look slightly longer term. Is a move towards BIM level 3 realistic for most in the infrastructure supply chain? The Level 3 journey is vital for the UK construction and smart city services agenda. Without it we will fail to address the challenges of urbanisation in time to make any tangible difference. We face unprecedented global competition and need to continue to be at the vanguard of engineering. It will be a challenge but like Level 2 we have set realistic time scales. We don’t expect to see standards and early adopters before 2020. Level 3 is a big jump and we need to introduce it properly to enable the entire sector to enjoy the massive opportunities and benefits it will bring. What are the priorities for a new government to help drive the use of new technology in construction? Joining up the dots. Government is one of the few entities with the ability to implement policy through procurement practice. It has a responsibility to help join the dots to enable cross sector learning, co-ordination of pipeline, commoditisation of common products and most importantly to delivery greater value by focusing on whole life services rather than short term capital cost. Government needs to be focused on joining the dots so the construction industry is delivering joined-up infrastructure for education, residential, communities, transport and healthcare. The digital construction economy will drive this, but we need a better joined up plan. The first in a series of Connection Events will be held in Manchester on 29/30 June and will demonstrate its new Connect Edition software and the way that it can assit the industry towards the goal of achieving the 2016 government mandate to embrace Building Information Modelling (BIM).